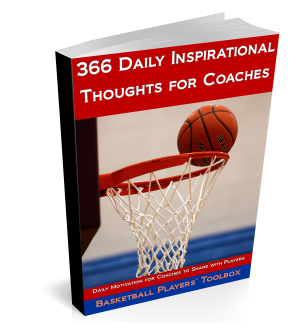 This drill is a real gut buster that is guaranteed to make you a better basketball player. You will also have a lot of fun playing it! We call it “Continuous One on One.” If you like to play One on One, you are going to love our version–it’s really One on One on steroids. You need to find a teammate to play against because this drill requires an offense and a defense. In Continuous One on One you don’t check it and start again after each basket. To start the game, both players start at the free throw line. One player shoots the ball. If it goes in, there is no point scored. The ball is live whether it goes in or not. This play is just to force you both to go after the ball. From now on, every basket scored counts. Score 2s and 3s just like a game. On EVERY foul, the player who was fouled shoots one free throw. If he or she is fouled while shooting, it is two shots. Make or miss, the free throw shooter gets the ball back. The purpose of this rule is to force the defense to work on guarding without fouling. In the flow of the game, When one player makes a basket, the other player retrieves the ball out of the net and tosses it behind the three point arc. The best strategy is to throw it out away from the player who just scored because they are now on now on defense. The player who tossed it out then sprints to get it and can score right away. You don’t wait on the opponent to get ready. Just like a five on five game, you try to score before the defense gets set. Another version of the drill you can use when you need a change of pace is to play “make it, take it.” When you play Make it Take it, when one player scores, they get the ball out of the net and spin it out behind the three point arc. The defense has to stop the offense to get the ball. How many players do you see playing one on one like that? Don’t you think that playing one on one like this is going to make you a whole heckuvalot better by? The only problem is that since the drill is so hard, you might have is finding someone to play against!